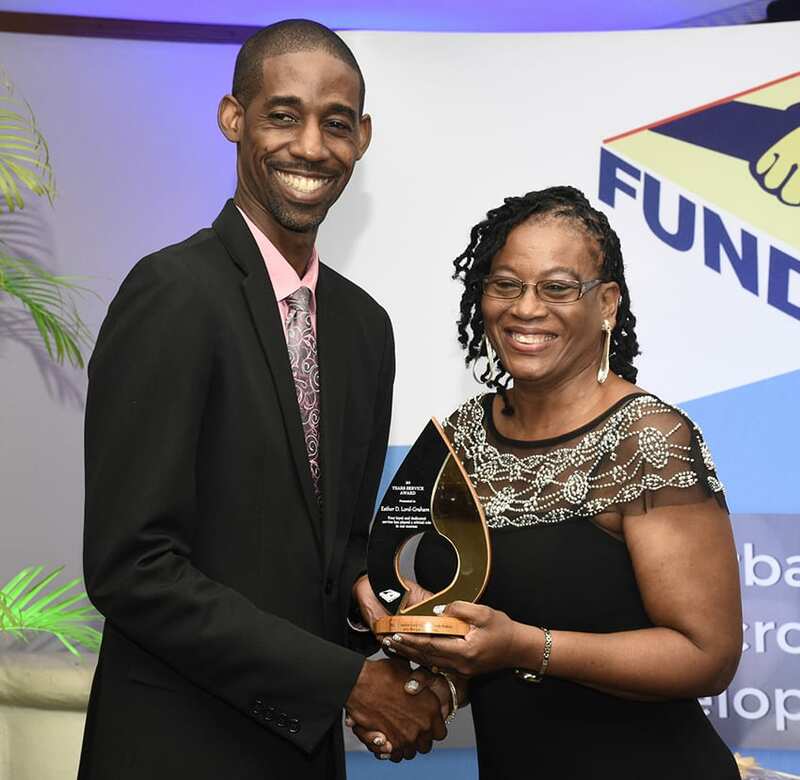 BRIDGETOWN, December 17, 2018 - FundAccess has stood and will continue to stand above the crowd in ensuring Government’s mandate in relation to entrepreneurship is realized. This assurance was given by Chairman of the Board of Directors, David Simpson, as he addressed the Fund’s 20th Anniversary Awards and Dinner at the Accra Beach Resort last Saturday night. Acknowledging that the board and management and staff shared a common passion for assisting small businesses and creating a sustainable entrepreneurial culture in Barbados, Mr. Simpson said FundAccess remained committed to being the guiding light in the execution and achievement of this mandate. “I commend the sound judgement and governance model that I have inherited and give credit not only to management but to our past directors. We cannot ignore our past, but we must be clear on our future intent and what it will take to realize it,” he stressed. However, the Chairman noted that despite the visionary leadership that led to the creation of FundAccess much of its work and accomplishments had “somehow gone unnoticed”. Emphasizing that FundAccess’ story had to be told in 2019, he said: “In real terms, we are not a lender of last resort, but rather the premier lending and support agency for micro, medium and small enterprises in Barbados. Mr. Simpson further noted that there was not an industry or service that the agency had not financed. And, he said the board and management, in an effort to ensure no one was left behind, had in recent years created a range of packages including the Business Boost, Facilitator, Innovator, Pro, Transport and others, up to a maximum of $150,000 per loan. “This is the only lending agency that I am aware of, that even when you are declined, will provide step by step guidance to you to ensure you understand what you need to undertake to be successful when you do re-apply. When we decline a loan, it is often the fourth or fifth option, after all efforts have been expended to provide approval to each client,” Mr. Simpson stressed. It was pointed out that the Fund had, at November 30th, disbursed $5,418,153 in loans for the calendar year, surpassing only two other occasions, which saw in excess of five million disbursed, namely in 2011 and 2012. “I am therefore confident that in 2019, we shall reach the $6 million mark,” he vowed. Lamenting that for too many years small business activity in the country had been dealt a “life-threatening blow”, Mr. Simpson said this was not just in relation to finance, but across the wider landscape in being able to access an enabling environment that would provide a level playing and the required infrastructure and capacity to grow. Meanwhile, General Manager, Esther Lord-Graham, in agreeing that FundAccess had helped to foster an entrepreneurial spirit on the island, noted that many of its clients reported that their off-spring, siblings, other family members and friends had followed them into some type of business activity. She said that for the next 20 years they looked forward to spreading their wings, owning their own home, continuing on their growth path and embracing technology. “The last 20 years were about surviving and planning. The next 20 years, though seemingly challenging, should be all about flourishing together, both as individual staff members and as an organization,” she surmised. Seven staffers received 20-year awards on the night for their dedication to the organization. These included General Manager, Esther Lord-Graham and Finance Manager, Carlisle Paul.